You are currently looking for Cumbrian holiday cottages in Seatoller to help you find the right cottage break you can filter the results. 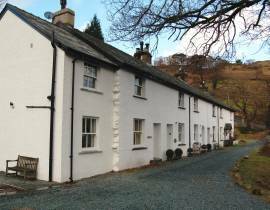 Ghyllside (Seatoller) sleeps a maximum of 6 people..
Ghyllside offers 5 star luxury in the heart of the Borrowdale Valley - a walkers' paradise. The cottage lies at the foot of Honister Pass, above the hamlet of Seatoller overlooking Hause Gill and England's most beautiful valley. The cottage underwent major refurbishment in 2005 and has tasteful furnishings and top quality appliances. 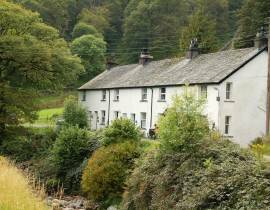 The Langstrath Pub in nearby Stonethwaite, offer beverages and home made food. There is a village store in Rosthwaite, 1 1/2 miles away and many more amenities in nearby Keswick. Derwentwater, Buttermere and Crummock water are all close by with many fantastic walks on the surrounding fells, including Scafell Pike and Haystacks. A must to visit is the slate mine at the summit of Honister Pass. Scale Force (Seatoller) sleeps a maximum of 6 people.. Scale Force offers luxury in the heart of the Borrowdale Valley - a walker's paradise. The cottage lies at the foot of Honister Pass, above the hamlet of Seatoller overlooking Hause Gill and England's most beautiful valley. This excellently equipped cottage underwent major refurbishment in 2007/8 and has tasteful, luxurious furnishings and top quality appliances.The owners brief was to create a luxury bolt hole in a beautiful location. Top of the range appliances combine with very comfortable furniture and tasteful furnishings to make this a place guests will return to time and again. The Langstrath Pub in nearby Stonethwaite, offer beverages and home made food. There is a village store in Rosthwaite, one and a half miles away and many more amenities in nearby Keswick.Derwentwater, Buttermere and Crummock Water are all close by with many fantastic walks on the surrounding fells, including Scafell Pike and Haystacks. It is possible to climb many of England's highest mountains straight from the cottage's front door. High Stile (Seatoller) sleeps a maximum of 7 people.. High Stile is a beautiful end of terrace cottage nestling directly at the foot of Honister Pass, overlooking Hause Ghyll at Seatoller, in the spectacular Borrowdale valley. This 4 bedroom cottage was extended, modernised and completely refurbished in 2008 by the owners, and now provides first class self catering accomodation in perfect surroundings. The many fells surrounding the valley include Scafell Pike and Haystacks and 2 beautiful lakes, Derwentwater and Buttermere are each within a few minutes drive. 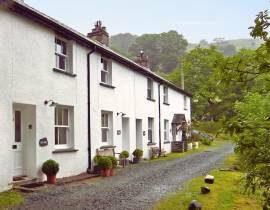 Rosthwaite is 1 1/2 miles, with a pub and village store and a wealth of amenities are available in Keswick, 8 miles away. There is a regular bus service between Seatoller and Keswick.